Welcome back! It's been a wonderful Christmas break, but it's time to get back to work. The new year has started quickly at Starfish, with my time being split between tying up loose ends left from before Christmas, to getting a jump on a bunch of new opportunities. However, there is a business concept I've seen a couple of times now that I think is interesting. It is a concept that I had the privilege to hear about when I was at AeroVironment (AV's Architectural Wind product is shown below, and another company, Marquiss Wind Power's product is shown to the right), and this is rooftop wind. Similar to rooftop solar, in that this allows the power generation to be close to the source (and therefore compete economically with the retail price of electricity, not the wholesale price). In addition the units, if designed well, allow the building to function as a wind funnel, channelling (and accelerating) the wind over the top of the building. 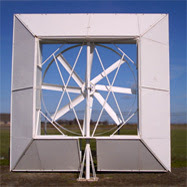 The turbines can be located in a zone of far greater wind-speed than the typical mean windspeed at ground level. This gives the turbines decent performance. 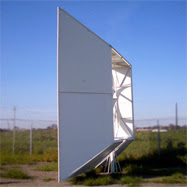 The final benefit is that the turbines can improve the visual aesthetics of a building. This is something that AV has done in spades with the ravenclaw look to their product. What's brilliant about this is that the initial reaction to having a bunch of turbines on a roof of a building is concern about noise and the building visuals. 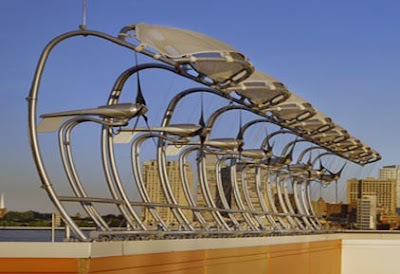 With an attractive design, the concerns over aesthetics are addressed, and the turbines allow a building's "green cache" to be much more easily seen and promoted. In the last year in Australia I have seen not one but two companies with a similar concept. Both had different product designs, one using a vertical axis. These products had some cost and reasonable payback difficulties. However, I thought, at the time, that it was interesting to see more work done on the concept. Well today it was announced that Marquiss Wind Power raised $1.3m from Velocity Venture Capital and Strategis Early Ventures. They have a ducted fan design (shown above and to the right). They are in their early design phases and their product looks a lot like the earlier iterations of AVs product, but there is room for improvement. Like many other cleantech products widespread adoption will be determined by the economics, so lifetime reliability, and $/W will be key. However, I'm interested that four different firms (at least) are pursuing this concept. I imagine that will actually be good news for these companies. When trying to prove a new concept to skeptical customers, a number of competitors in an early growing market can be a good thing as competitors are far more likely to validate the concept than compete for a specific sales dollar. So, it will be interesting to see if more companies jump in this space, and to see whether or not the economics can succeed.